Can you believe it is November already?!? This school year is already FLYING by! I'm ready though.. bring on the cold weather, comfy clothes, hot chocolate, and snuggling by the fire! (Ask me the same thing in February and I will be sick of it!) But for now, I'm so excited that it is Currently November time over at Farley's blog! Loving: I absolutely love warm drinks on a cool Fall/Winter day! Even though I don't love coffe, I love fru fru drinks from Starbucks... and my biggest weakness is mixing all the cappuccino flavors at Circle K... oops! Wanting: I cannot wait for family get togethers and turkey and mashed potatoes on Thanksgiving. The holidays are one of my favorite times of the year. Hubby and I both have big families and it is so great to see everyone so much this time of year. Music: Country music soothes my soul. In fact, I'm playing a little Tim McGraw right now. My students love listening to country during writers workshop or other silent work time. It relaxes me and it's easy to find school appropriate songs. I love it! Thanks for stopping in and reading my currently! 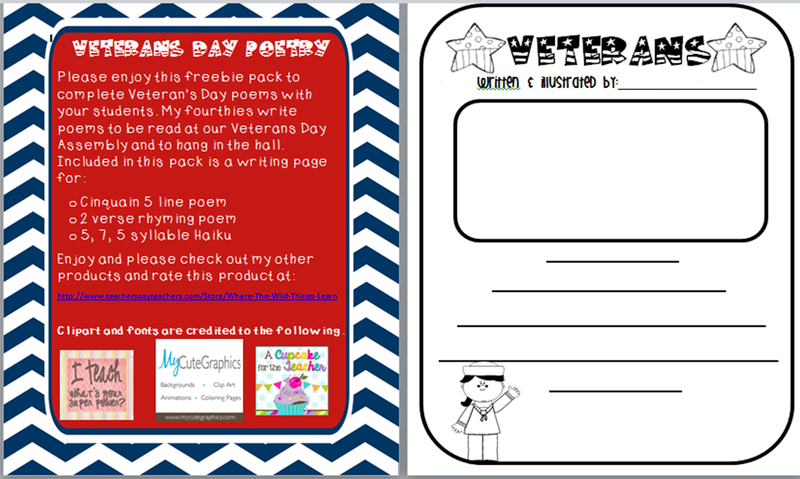 One of the things I've been working on here is poetry paper for my students to start writing their final copies of their Veteran's Day poems tomorrow. We are talking about Haiku's, Cinquain, and Rhyming poems. Click on the picture of the preview to download your free copy! I hope you enjoy this freebie! And check back soon because I will be posting a great Thanksgiving spelling unit and Pilgrim unit! Have a wonderful night blogger world. Oh my goodness - I found you over at the linky party and I'm so glad that I did!!!!! Welcome to this wonderful world of blogging..and make sure you don't stay at school TOO late TOO often!!!!!! HI! I just found your through the Currently! Your blog is so cute!